While dreaming of Hawaii often depicts perfect scenes of green mountains and sandy beaches, food is what comes first to my mind. One of my favorite things to do on the island of Oahu, along with stand up paddle boarding, and straight up relaxing, is to enjoy the awesome food the island offers. The Asian fusion food, that has become uniquely Hawaiian food, offers a tasty repertoire for anyone who loves to eat. The last time I was in Hawaii I took a day trip drive around the island of Oahu, which takes around 3 – 4 hours if you don't stop anywhere, but we stopped at the Hukilau Cafe for brunch. 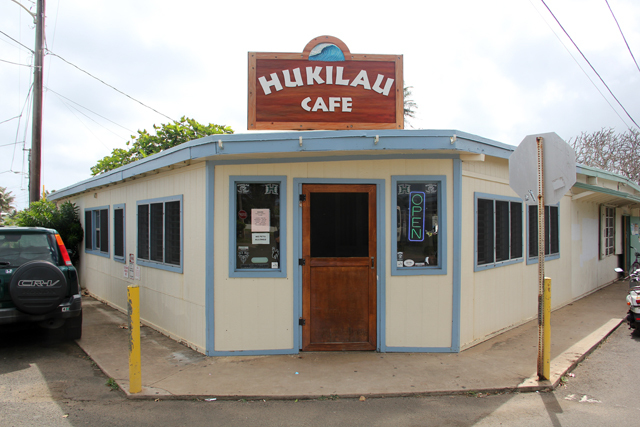 The Hukilau Cafe is especially famous for being included in Adam Sandler's 50 First Dates movie. But despite being famous for being featured, they serve some delicious home-style Hawaiian favorites. Just off the highway and within the quiet neighborhood of Laie, is Hukilau. The cafe is in a small trapezoidal house that's been converted into a restaurant, and you'll know you've arrived when you notice the stream of vehicles that are parked on the side of the street. The restaurant attracts both tourists that are looking for good food (and driving around the island), and locals from both Honolulu and Laie (the small town where the restaurant is located). The menu is quite simple including usual dishes like teriyaki chicken and beef, loco moco (a hamburger patty over rice topped with a fried egg and smothered in brown gravy), chicken katsu, and the Hukilau burger. They also are famous for serving macadamia nut pancakes, but I was more interested in the lunch dishes the day I went. We ordered a good selection of food and it was all quickly delivered to our table. 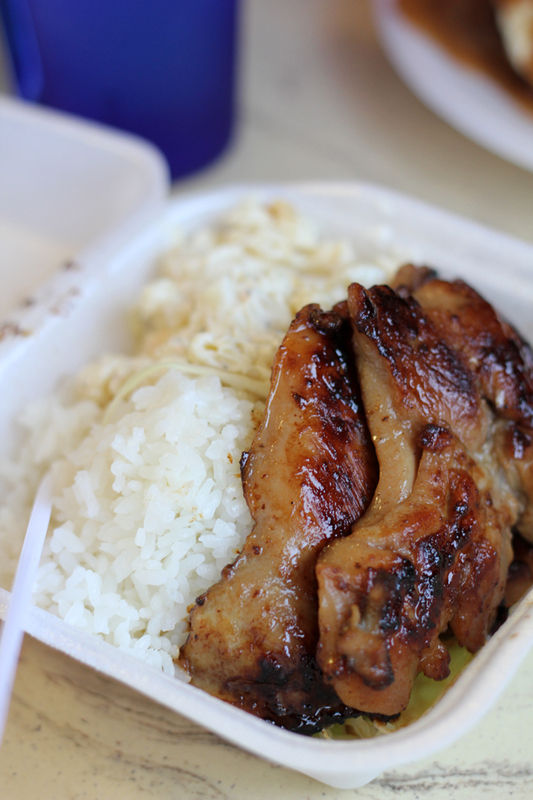 The teriyaki chicken and teriyaki beef were both excellent, gracefully sitting on a pile of hot steamed rice and complemented with a side of creamy macaroni salad. 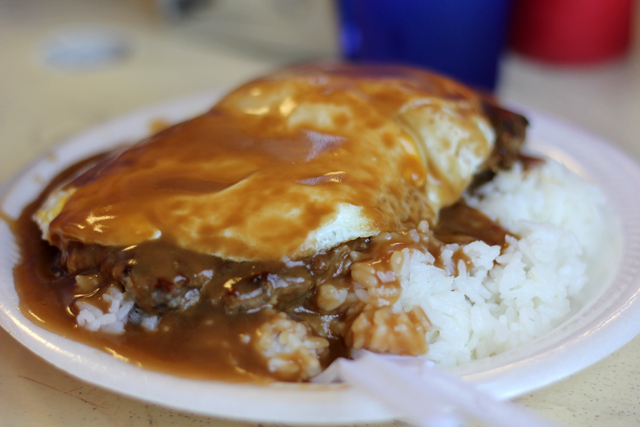 The loco moco, which I learned was eaten by Adam on the tv show Man vs. Food, in my opinion was not nearly as glorious as the version from Papa Ole's restaurant, but it still wasn't bad. Hot steamed rice was first piled onto a plate before the meaty grilled beef burger was placed on top. A fried egg, which was cooked sunny side up with an oozing yoke, was laid on the burger, and finally the combination was drowned in a generous scoop of thick brown gravy. The final dish we ate was the Hukilau Burger, and I must say, it was impressive. Within the toasted bun was a beef patty, a fried egg, cheese, raw onions, tomatoes, a leaf of lettuce, and the real stunner, a mouthwatering slab of teriyaki beef. The harmony of the flavors in each bite was a winning combo. LOVED me some Hukilau! That burger was ideal after a day hiking around. The Loco Moco looks so delish! I can’t believe it. In 2011, we visited Oahu and stayed at a rental vacation house in Laie with a private beach. I remember eating here a couple of times. Loved the food. I had totally forgotten the name of the place! Would definitely need to add that to my Oahu blog post! Loved reading this post; it brought back fond memories of our trips to Oahu. 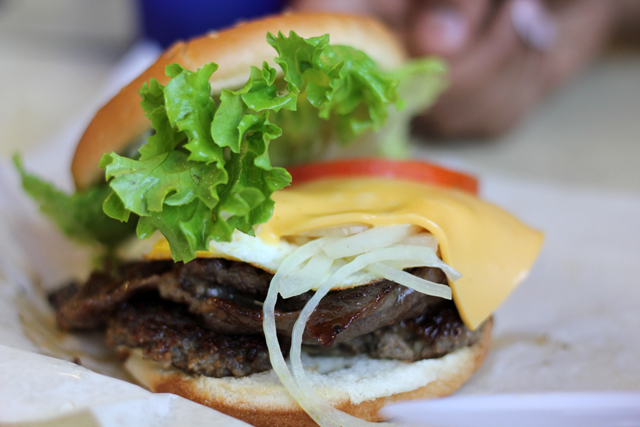 I can’t wait to return and try the Hukilau Burger at The Hukilau Cafe. Thanks for sharing, I’m getting hungry now! Although “Hukilau” is a common term, and the Cafe in the movie “50 First Dates” was called The Hukilau Cafe, the Cafe in this article I s, in no way, the cafe filmed in the movie. The movie cafe scene was filmed on a soundstage with a CGI background to depict the background lagoon. That’s I what I read various time. Is not the cafe in movie.